The AirPiano's infrared sensors track the movements of your hands. While many hi-tech musicians are still getting excited about the potential of touch screen technology - JazzMutant's Dexter and Lemur utilise this to great effect - interface design student Omer Yosha has gone and created a controller that doesn't require you to touch anything at all to play piano. 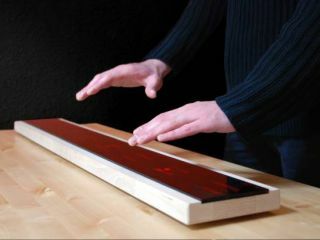 The AirPiano looks rather like a technologically advanced plank and enables you to control music software using an invisible matrix of controls. It uses infrared sensors and offers virtual keys and faders. The hardware connects to your computer over USB and communicates with a dedicated software utility. LEDs provide the user with visual feedback. If you want to see how the device works, your best bet is to watch the video that its creator has posted on the AirPiano website. While controllers like this might have potential as live performance tools - watching the AirPiano being played is certainly engaging - we're not sure whether musicians will ever prefer them to fully 'hands-on' devices. Still, they certainly provide scope for experimentation, and might even enable the creation of new musical genres.